Betty! I'm still not enjoying the stitch pattern, I think it is pretty monotonous. 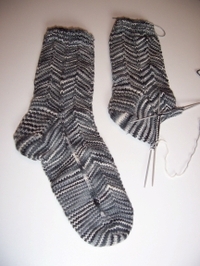 BUT - the reversible ribbing is really kinda neat. DARK! Going from black to this... boy oh boy. I did some swatching this week and discovered that pattern printers/makers/designers need to be more specific. The first row of the pattern repeats goes something like this: "inc. one in each stitch." Yes, that's it. No "M1" or "kf&b" or "pf&b" or anything else! (it's a ribbed pattern, hence the purl) And, no further direction in the abbreviation meanings section. Could not find another blogger who has made this garment (please share if you know one), no corrections on Rowan's website. Argh! So, many swatches were made (in a lighter color yarn! ), using different technique combinations. Since the fabric is supposed to be reversible, it was determined that the technique for obtaining this was kf&b of each stitch (bolded in case there is someone out there who has the same question). I'm concerned about the future seaming due to the ribbed pattern, so I think for the back piece (the piece I'll start when the needles I ordered get here) I'm going to add a K1 to each end. I'll have to do a bit more thinking when it comes to the front pieces, but, what do you think?